When you are considering filing a personal injury lawsuit over an accident, it’s critical that you calculate the total financial value of your combined losses. 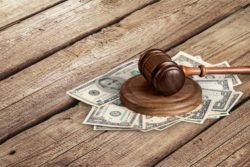 Damages paid to the injured victim may be negotiated or fought for in court, but lacking a definitive monetary amount may result in settling for less than you actually deserve. The bulk of your compensation award will likely stem from compensatory damages. Compensatory damages are designed to restore the victim back to the financial state they were in prior to the accident, so it includes any medical bills, property loss, income loss and pain and suffering. To calculate the extent of your medical bills, add up the total amount of all your bills and prescription medications. Property loss should consist of any repairs to your property or the total value of your property. If your car was totaled in a car accident, then you need to ask for the total value of your car prior to the accident. Determining your income loss should consist of evaluating your average weekly income and calculating how many days from work you have lost due to the accident. Calculating the financial amount worthy of restoring you from the pain and suffering you’ve endured is more difficult. Enlisting the help of an experienced attorney and expert witnesses can help you make a case for the compensation amount you are looking for. Sometimes, the person’s negligence has been so extreme that courts will award an additional amount of financial relief in order to deter the individual from behaving that way in the future. Richard A. Stoloff has represented clients injured in accidents since 1991. He understands exactly what is needed to obtain full financial compensation, and he will aggressively pursue your rightful claim from the liable party. Reach out to his office today by using this contact form.